This article is very overdue – apologies to Wine-Pages readers and to the dedicated, delightful and often overlooked wine producers of Uruguay. A quick search on this otherwise comprehensive website reveals just three mentions of Uruguay, and just a single, solitary tasting note for a Uruguayan wine. It’s high time that I redress the balance. This is a two-part feature. My first visit to Uruguay was during harvest in March 2002 when there were already around a dozen wineries exporting. I was extremely impressed with many of these and received a tremendous welcome. The next visit was with the Circle of Wine Writers in October 2004, and wines I had tasted in the meantime showed welcome improvements. By this time, there was an increase not only in quality but also in the understanding of what the UK market might be looking for. What became obvious was that Uruguay could not compete on price with the big New World countries including Chile and Argentina – a niche market position was the only choice. In August 2006 a short visit to just a handful of wineries in order to discuss a UK tasting programme to wine clubs (to be delivered by myself and fellow wine educator and contributor to Wine-Pages, Vivienne Franks) confirmed progress, and our subsequent tastings have been really rewarding with consumers being surprised by the high quality of the wines we chose! Uruguay is South America’s 4th biggest wine producer after Argentina, Chile and Brazil. The country is about the size of England (not the UK), with a mere 3.4 million inhabitants. Its capital, Montevideo (with nearly half the population) lies on the Rio del Plata, across from Buenos Aires. Uruguay is a peaceful country (neutral in World War II, making lots of money from, amongst other things, supplying Fray Bentos corned beef to Europe). However its economy is not entirely stable, usually suffering when its neighbour Argentina (an important source of tourist visitors) endures a crisis. The city of Montevideo is said to be the second safest capital in the world after Tokyo – and in my experience, since everyone seems to know everyone, I can believe this! 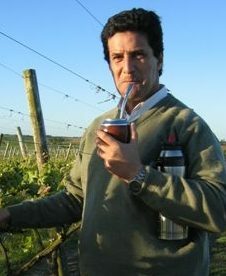 Most Uruguayan men drink maté (a hot drink made from steeping the caffeine-containing yerba maté herb in hot water) all day out of a gourd-like container with a straw. It is rare to see anyone in the countryside not clutching their flask. Uruguayans produce and eat lots of high quality beef – consumption is at a staggering 60kg per annum per person – and they are partial to all other meats, though being on the Atlantic coast, the seafood’s not bad either. One of the best places to try out a fine asado – meat barbecue – is at a busy lunchtime in the atmospheric indoor market in Montevideo. Today full of restaurants, the Mercado del Puerto is a fabulous Victorian building that was built as a railway station, destined originally for Buenos Aires. A bottle of Tannat to accompany your asado provides a great introduction to the Uruguayan wines and the country. Montevideo lies at approximately 35° south of the equator, as do Mendoza in Argentina and Santiago in Chile, however Montevideo is approximately 1000 kilometres from the Andes. In fact, the two wine areas that Uruguay is most often compared with are Bordeaux, because of the Atlantic-influenced climate, and New Zealand. Uruguay and New Zealand have a similar population; they have some shared vineyard issues relating to high humidity, and finally the Uruguayan wine industry would dearly like to emulate New Zealand’s wine industry success. There are around 9,000 hectares of vineyards, with the largest concentration in the regions of Montevideo, San José and Canelones, within about an hour from the capital. There are other vineyard areas to the west, near the lovely old town of Colonia del Sacramento, and more scattered around the country including an interesting outpost in Rivera, on the northern border with Brazil. The vineyards are generally like much of the country, on flat land or very gently rolling hills. The climate is maritime-influenced, with ocean breezes, generally warm, or even hot in summer, but rarely experiencing extremes. The biggest hazard is disease-inducing humidity or rainfall at the wrong time, close to or during harvest. Vintages vary quite widely. Soils tend to be quite rich and fertile so vigour can be a problem. Over the past 20 years, considerable advances have been made in vineyard management, especially changing the vine training systems to cope with the vigour/disease issues. Vertical Shoot Position is now taking precedence amongst quality producers over the Bordeaux Lyre System or Y Trellis, though the latter is still common. To cope with humidity, historically many hybrid grape varieties have been grown, but in a drive to move away from quantity production to quality production and increase export potential, over the past 20 years, there has been a big switch towards vinifera varieties. Over 70% of varieties grown are red, with the key grape being Tannat, of which more in a moment. Other important international varieties include Merlot, Cabernet Sauvignon, Cabernet Franc and Syrah for reds, plus Sauvignon Blanc and Chardonnay for whites. There are small plantings of many other varieties including Pinot Noir, Marsanne and Viognier. Tannat is the star performer in Uruguay. Traditionally used in Madiran (mostly in blends with Merlot), it was brought over in 1870 by a Basque named Don Pascual Harriague credited with ‘modernising’ wine production in Uruguay – descendents of original cuttings of the Tannat grape continue to be known here as Harriague. Tannat produces deep red wines with a herbal, black fruit (or even blueberry fruit) nose, but the palate, though often full-bodied and rich, can be very tannic and unyielding, especially in years that are wet or when the grapes are not fully ripe. The answer to taming this grape lies mainly in vineyard management, but cellar techniques are also important. Historically it was aged for too long in poor wood, exacerbating the hardness or greenness of the wine. Today, better skin or cap management techniques are used, occasionally with micro-oxygenation, and there is improved use of oak. The other solution to taming Tannat is to blend with other varieties. Merlot is the most common blending grape as it gives a softening effect along with some red fruit characters, but other varieties are used to a greater or lesser extent to produce blended Tannat wines at different price levels. It is one of those grape varieties that leaves its mark even when there is only a relatively small percentage present. In this small country, there has traditionally been a high per capita wine consumption, mainly of semi-sweet rosés or whites, and every-day reds, typically from demijohns, which are still produced by many of the wineries, including some of today’s exporting wineries. As recently as 1991, Pisano (see ‘Wineries’ in part II) sold 95% of their wines in demijohns, today the figure is still 50%. An export drive (perhaps too strong a word for it), started in the early 1990s, with a few of the nearly 300 wineries attempting to up their game and compete on export markets. Today less than 5% of production is exported. The UK has seen wines from Uruguay come in spasmodically, with few importers really getting behind the country until recently. Today, several wineries have agents and/or distribution in the UK and it is hoped that more will find a niche as these wines are well worth the extra price in what they offer in originality and elegance. See all stockists of Uruguayan wines on wine-searcher. Apart from the wines themselves, by far the most attractive side to the Uruguayan wine industry is the nature of the people that produce the wines. The only fairly new winery in the list, Elisa and Juan Bouza made their money in the food industry. They decided to buy an established vineyard with some fine old vines, and, some distance away a beautiful estancia, where they keep rare breeds of sheep, vintage cars, and have planted new vineyards and created a state-of-the-art boutique winery. They focus on just a few grape varieties, which include Chardonnay, Merlot and Tannat and, unusually, Tempranillo and Albariño reflecting their Spanish family origins. Attention to detail is high and shows through in the clear-cut, elegant and sometimes intense wines. Some of the range is available from Great Western Wines. The Carrau family was one of the first to recognise the export potential for their wines. With two sites and wineries, one in Rivera on the Brazilian border (wines from here are marketed as Cerro Chapeu), and the other in Canelones (Castel Pujol), for some years they have had a good selection of fruit and more than competent winemaking. With a wide range of wines, they were the first to produce very fresh, flavoursome Sauvignon Blanc from both wineries, and an excellent, ageworthy Tannat Amat from Cerro Chapeu. One of the larger quality wine producers, the Etcheverry family has two vineyard sites covering 130 hectares, mostly trained to the Lyre system. The Catamayor wines used to benefit from the consultancy of New Zealander Duncan Killiner (who subsequently married a daughter of the family) and this gave them a good kick-start to making clean, tangy Sauvignon Blanc. They are also known for Cabernet Franc, of which they have parcel of old vines, making an interesting reserve wine. Reinaldo de Lucca is one of several great characters of the Uruguayan wine world. Keen to tell you of his Italian family background and his three university degrees from Montevideo, Penn State (USA) and Montpellier (France), he’s a passionate Francophile and traditionalist, but nevertheless fiercely proud of his part in the growing success of the Uruguayan wine industry. Also involved in a vine nursery business, he farms his vines as naturally as is possible, and keeps his winery as basic as possible. Along with some excellent Tannat and Tannat blends, he makes an exotic Marsanne and an elegant, spicy Syrah. No agent, but the Wine Society stocks some of his wines. The largest of the serious exporting wineries, Juanico has been owned by the Deicas family since 1979 and they have gradually transformed more than 200 hectares of vineyards and adapted the winery to produce quality wines. A large range is made of unoaked and oaked wines for various markets culminating in an up-scale Tannat blend, Familia Deicas made in very small quantities in conjunction with Bernard Magrez. Viognier has been successful in blends with Chardonnay here, and there are various good Tannats. The ultra-premium Gran Bodegon (or Preludio) red (a Tannat blend) and white (Chardonnay-Viognier blend) are both good. A relatively small family winery, this is an up-and-coming name to watch, with young Juan Marichal leading the way after five years experience in Mendoza, Argentina. They have 48 hectares, not yet all geared to fine wine production, and along with the usual varieties, they grow some Pinot Noir, which has done well on its own and as a surprisingly successful blend with Tannat. Their Chardonnay is also excellent. The wines were imported into the UK by the Cellaret, which has recently gone into liquidation leaving Marichal in the lurch. Let’s hope they find a new importer soon. Perhaps the leading quality wine producer of Uruguay. Currently without a UK agent, despite exporting to over 18 countries, winning a string of accolades and beloved by the media, it seems that the problem here is the relatively high price of the range. Based in Progreso, Canelones, the Pisano family of three brothers (one manages the vineyards, one the winery and one the exports), produces a huge range of wines, in particular reds, and it is unusual not to like them all tasting through the range. They make excellent Tannat at various levels, up to the intense Axis Mundi and including a cross between a port and an amarone, called Et Xe Oneko. Carlos and Ana Pizzorno are dedicated to building up their small family business, which dates back to 1910 when Carlos’ grandfather first planted vineyards. Carlos made the move from quantity to quality wine production and his love is the vineyard, where he constantly experiments to improve the grapes, keeping yields low. In the winery, which they have recently expanded, they have advice from New Zealander Duncan Killiner. An excellent Sauvignon is produced along with very good Tannat and Tannat blends. Other wineries of interest to look out for in the future include Filgueira, Stagnari, Toscanini, Traversa and Los Ventos from Canelones, and Irurtia and Los Cerros de San Juan from Colonia.